How to make a Equipment Maintenance and Inspection Record? An easy way to start is to download this Equipment Maintenance and Inspection Record template now! For company and business establishments, keeping a maintenance log is very important. A company engaged in renting out equipment will always have a good equipment service log. Use it to keep track of the conditions, functioning, and maintenance of the equipment. After all, it is the bloodline of their business. Breaking down of hired equipment because of poor maintenance isn’t good. It will make them lose money and will certainly be bad for their business reputation. It helps prevent costly repair work because of poor maintenance. Equipment for hire is constantly subjected to wear and tear. It’s therefore imperative to conduct a maintenance check after every rental. In doing this, you can fix minor damages before they get worse. You should document each check-up or repair in the equipment service log. Do this to ensure that the equipment is always in good shape for the next rental. It helps you develop specialized programs for equipment maintenance. A equipment when rented out is usually subjected to varied working conditions. Each of this may require a different maintenance check-up. You need to record data from these check-ups all the time. This data may help you determine the type of maintenance work needed for each equipment. It may help prevent any issues with regards to warranty claims. Documentation of maintenance work is a vital factor when dealing with warranty claims. Always document all maintenance work on equipment. This will include exact dates and time of the repairs as well as what repairs done. This will greatly help in determining the business’s rights for any warranty claims. It enhances the safety of the machine and equipment operators. Well-maintained equipment is less likely to cause accidents in the work area. It happens due to machinery malfunctions. Operators are usually the ones who take the brunt of such accidents. But you could have avoided these accidents in the first place. Like a patient’s file, the equipment service log will keep track of the equipment’s health. Looking at such log will determine what kind of maintenance you should perform. This is vital to ensure the people’s safety in the work environment. It helps you keep track of the one accountable for machines and equipment. The machinery maintenance log keeps track of all operators who handled the machine. So you can hold accountable those who have inflicted damage to it. This is especially important when accidents happen. Having the log will certainly remind operators to take care of their equipment. It improves the resale value of your equipment. Equipment that is well-maintained will keep its resale value high. It will not depreciate much. The log will be proof of its high-maintenance to prospective buyers.Very well-maintained and well-documented equipment can demand a higher price. Now we provide this standardized Equipment Maintenance and Inspection Record template with text and formatting to help you finish your document faster. If time or quality is of the essence, this ready-made template can help you to save time and to focus on what really matters! It comes in Microsoft Office format, is ready to be tailored to your personal needs. Completing your file has never been easier! 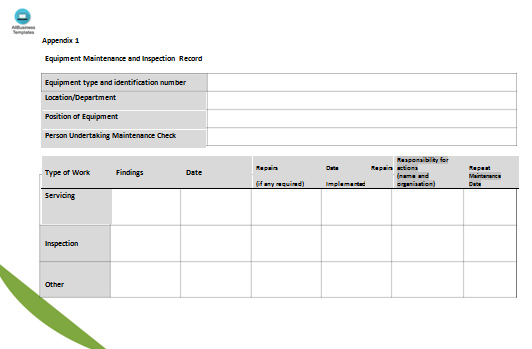 Download this Equipment Maintenance and Inspection Record template now! This template will perfectly suit your needs! And after downloading you can craft and customize every detail of its appearance very quickly.